Uber has won the right to take Transport for London (TfL) to court over new rules which would require its drivers to pass English tests. TfL wants all private-hire drivers to undergo reading, writing and listening tests from 1 October, which the High Court has accepted. However, Uber has been permitted to challenge if exemptions can be put in place for some drivers. TfL said it was making the changes "to enhance public safety". It also wants to implement regulations which require Uber to provide a call centre service for passengers to contact during a journey if required, which the High Court has also agreed in principle. However, the Ireland-based transport company will challenge whether that service has to be in London, before any form of that regulation can be introduced by TfL. It will also challenge whether TfL must be notified of any changes to its operating model. 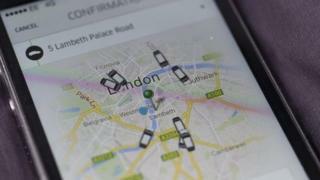 Tom Elvidge, general manager of Uber London, said: "We're pleased the judge has decided this case deserves a hearing. "TfL's plans threaten the livelihoods of thousands of drivers in London, while also stifling tech companies like Uber." Uber had initially supported the test, but now argues the requirement that drivers provide a certificate showing they have an intermediate level of reading and writing is unnecessary and costly. It has more than 30,000 drivers in London and estimates thousands would be affected by the change. TfL said: "We note that the court has refused permission for judicial review of the principle and standard of English language test, the requirement for hire and reward insurance and the ability for customers to speak to someone by telephone. "We are determined to create a vibrant taxi and private hire market, with space for all providers to flourish. "We look forward to the remaining issues being resolved in due course."